Before searching for EBM materials it is helpful to frame your question using the P.I.C.O. method. You should also ask what type of question are you asking - diagnosis, etiology, therapy, prevention, or harm? The pyramid below illustrates the spectrum of materials one can find. At the bottom of the pyramid are the materials that are the least clinically relevant. At the top are the most clinically relevant. Source: Source: SUNY Downstate Medical Center. Medical Research Library of Brooklyn. Evidence Based Medicine Course. 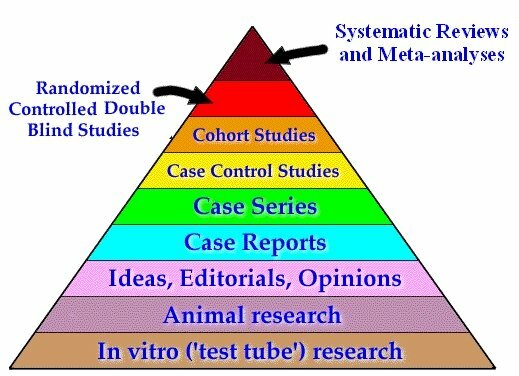 A Guide to Research Methods: The Evidence Pyramid.